Southbound Interstate 5 remains closed, and officials urged motorists to avoid the area. Detour routes were being heavily used. Northbound lanes of the freeway are open to vehicles. Southbound Interstate 5 will be closed at least through Tuesday morning in the area around Monday morning’s deadly train derailment between Lakewood an Olympia. State and emergency officials were pleading with drivers Monday to avoid the area, as every possible detour along local roads and highways was clogged with traffic and it was unclear when the freeway would re-open. The National Transportation Safety Board, which will investigate the derailment, had officials on the scene Monday afternoon and its “go team” was due to arrive late Monday evening. “Everyone should avoid traveling I-5, and WSDOT is working to open alternative routes through the area during emergency response,” Gov. Jay Inslee said in a statement. But those alternative routes were already at or near capacity, as a major chunk of the busiest highway in the state was shut down. 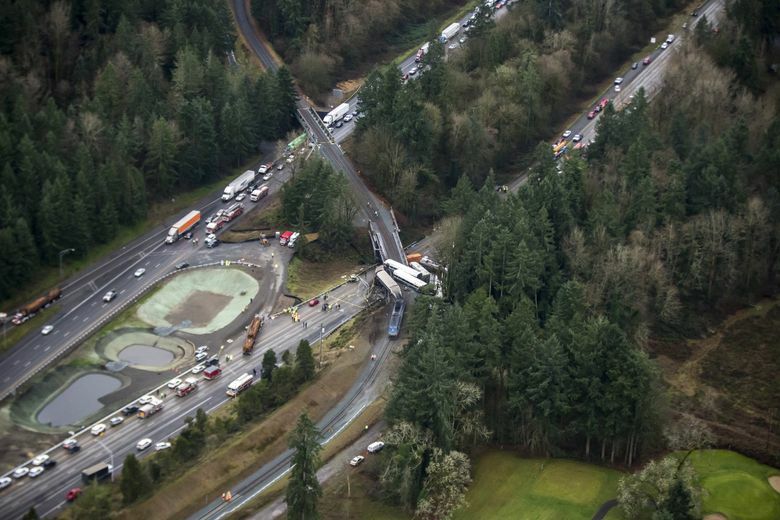 About 60,000 vehicles travel on the now-closed section of southbound I-5 each day, WSDOT said. At 12:30 Monday afternoon, WSDOT began diverting southbound traffic through Joint Base Lewis-McChord, which opened a road on its perimeter to general traffic. Exit 118, at Center Drive, was open to general traffic, which could connect with Perimeter Road and then State Route 510. Gary Dangerfield, a JBLM spokesman, said he expected the detour to remain open through Tuesday morning, although that could change. Dangerfield stressed that drivers should not take Exit 119, which accesses the base, as it was still closed to general traffic. Northbound I-5 drivers were being encouraged to stay on the freeway and not exit at Center Drive, to make it easier for southbound traffic to access the detour. WSDOT said to expect major delays on alternative routes, especially Monday evening. WSDOT suggested drivers take the Tacoma Narrows Bridge, traveling north to Port Orchard and then south to rejoin I-5 in Tumwater. 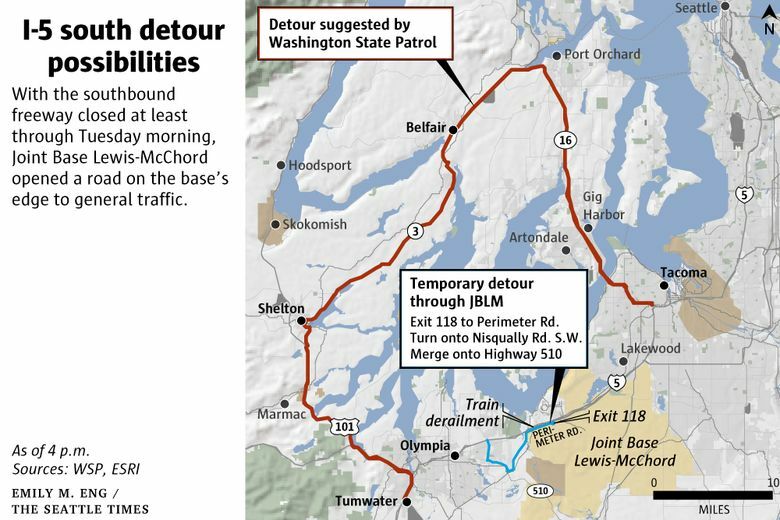 That route is a detour of about an hour and a half, but other routes are worse, WSDOT said. Another suggested alternative was to head south on Highway 7 from Tacoma, before heading east on Routes 702 and 510, to reach Olympia. Other routes around the closure include taking Highway 7 south from Tacoma and connecting with 507 outside of Spanaway. Route 507 reconnects with I-5 in Grand Mound, well south of the closure. 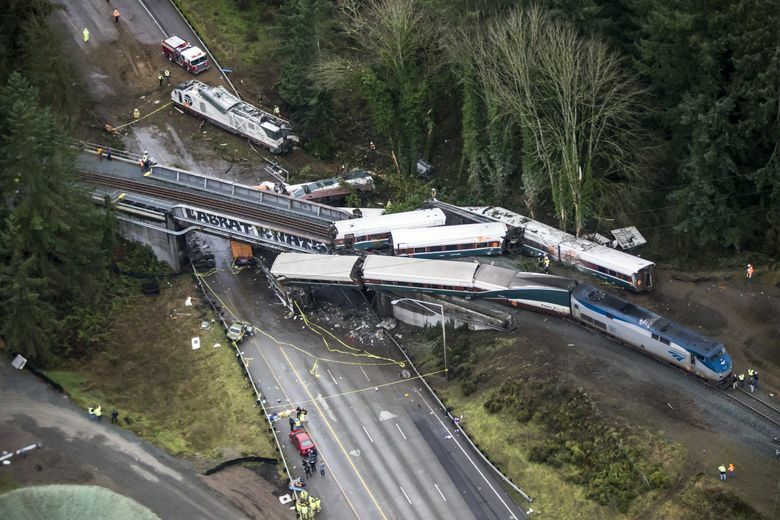 Inslee said he had been in touch with Amtrak about possibly providing a crane to help clear the roadway.